Its Game Day Hoosier Nation! The loss against the Spartans was a step back for this Hoosier defense, which looked absolutely gassed by halftime as Michigan State controlled the tempo of the game. This week the Hoosiers face a more explosive offense in the Wolverines who average 39 points per game. However, Michigan’s offense does have a weakness holding them back. 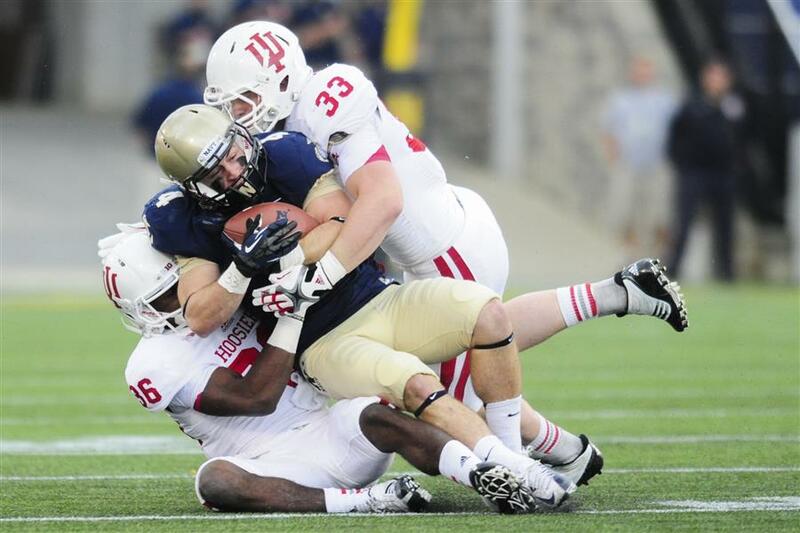 We will look at the keys to victory for the Hoosiers defense. 1. 3rd Down Efficiency- Last week the Spartans were a mouth dropping 10-14 on third down conversions against the Hoosiers. It did not matter if it was third and three or third and 20, the Spartans found a way to pick up the first down. Needless to say the Hoosiers must improve this number and get some stops in order to get their defense off the field. On the season Michigan is right in the middle of the Big Ten in third down conversions at 47%. If the Hoosiers can get Michigan into third downs where Devin Gardner has to throw the ball it will play into IU’s favor. 2. Create Big Plays- There is no better way to silence 110,000 fans than to create big plays on defense on the road. The Achilles’ Heel of this Michigan team are turnovers. Devin Gardner has throw 10 interceptions along with his 11 touchdowns and they have also put the ball on the ground 11 times while losing four fumbles. The Indiana defense must be aggressive and hurry Gardner into bad throws and try and rip the ball out of the hand of the Michigan runners. The Wolverines has also allowed 14 sacks on the year. Tim Bennett and the Hoosier secondary should have a busy day knocking down passes while also coming in on the run game and trying to pry the ball out of running backs’ hands. 3. Tackle- Duh, right? Well the Hoosiers were burned last week by missed tackles as Michigan State turned 4-yard passes into big plays. Indiana will have a tough match up against a more athletic Michigan offense, but that should not mean that a defender has to just dive aimlessly at the ball carrier and hope they knock him down. The Hoosiers must gang tackle on defense and bring the ball carrier down early setting up third and longs. If the Hoosiers can get a couple big plays, tackle the ball carrier, and limit Michigan’s third down conversions they should have enough offensive firepower to win this game. Michigan will make some big plays and Devin Gardner will probably scramble for a big gain on third and long, it is up to the Hoosiers to forget about it and move onto the next play and try and create a big play of their own. So where ever you are grab some lunch, a beverage and get ready for another exciting week of college football.